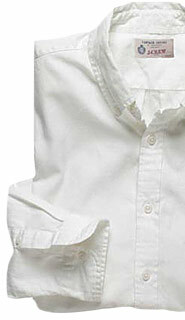 Introduced by Brooks Brothers in 1896 and distinguished by its loose weave and sporty button-down collar, the preppy stalwart is making a comeback due in large part to guys like Thom Browne, who eschews the endless rainbow of pattered shirts for the simplicity and versatility of the humble white oxford. It's also a nod to a time when men couldn't be bothered with so many choices. Nostalgia aside, those of us looking to stretch a dollar will appreciate the shirt's practicality. The oxford is a workhorse—durable enough for the corner laundromat and compatible with everything from your fanciest flannel suit to a corduroy knockabout. Best of all, it often costs considerably less than its broadcloth equivalent. Your best options can still be found at Brooks Brothers, which now offers a slim fit version of the eponymous original, although a fine substitute can be found at J. Crew whose vintage Oxford has a tailored fit and shorter tail, for those boys who regrettably still insist on an un-tucked shirt. Skeptics that worry the shirt will place you squarely in the khaki-clad masses, have no fear. The key to making your oxford befitting of your urbane aesthetic, is finding the right fit. Take proper measurements of your neck and sleeve and choose a slimmer, more tailored version to avoid that deflated balloon look. And lose the starch. Still jonesing for a splash of color? A gingham pocket-square and red socks do the trick.